Runs With Spatulas: Finally! Homemade Pasta! Oh my goodness! So after I posted yesterday, my internet went out AGAIN. So I'm praying and crossing my fingers that my connection remains good while I'm trying to post this. Annnyway. I think I've gone Cooking Light crazy lately. Or something. Maybe it's just that I've gotten a fresh batch of recipes that I want to try, and the source really doesn't have anything to do with it. I don't know. But I do wish that I could subscribe to the CL magazine -- if only I wasn't moving in a month and a half. I saw this recipe in the new April issue, and the whole "make your own pasta" kind of intrigued me. I've never made it before, never had it before, so I wanted to know if it really was that much better than the dried stuff bought in the store. I know I mentioned yesterday that I searched high and low for that dang chickpea flour. Well, I never did find it. I even went to Trader Joe's in a last ditch effort after work yesterday, but nothing. I gave up and just used regular flour instead -- like the other pasta recipes called for. Problem number two -- to make the dough, you need a food processor with a food chute, one of which I do not have. So I figured the blender with the hole in top would suffice. And it did. The dough came together quite nicely until the very end when it started getting thick. Then it caused the blender to pop off the rubber rotator underneath, which it then promptly tore to shreds. I killed my sister's blender -- oops. Good thing she thought it didn't work to begin with. After letting the dough sit for half and hour and mixing up the chickpea paste for the inside of the ravioli, I'm ready to start making my stuffed pasta. The recipe says "lightly flour." Ha. I continually fought with the pasta sticking to the counter, which increased the time it took to make these. Which was long enough as it was. Yes, I really didn't think it would take forever and a day to make all these raviolis, but it did. I actually ran out of the chickpea paste before I ran out of dough (although that made me very happy), so I just resorted to making the hand-rolled pasta that was a few pages before the ravioli. 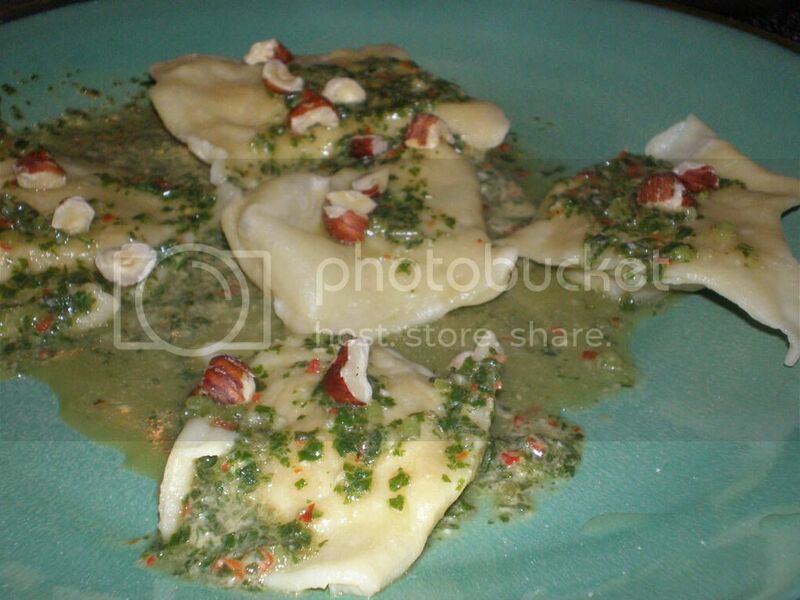 I realize that my ravioli look absolutely horrid in all of these pictures. It was a lot more difficult than I expected it to be. But I made them, ugly as can be, but they were there. And tasty. I was a little leary of what the whole "chickpea with basil pesto and hazelnuts" flavor was going to be. Especially since the paste smelled very lemony when I was mixing it up. However, once everything was said and done, it was absolutely declicious. Mine was a little cold since they were the first raviolis out of the pot and I had been taking pictures of them -- but it was still delicious. It was totally not the taste I was expecting. The red pepper in the pesto definitely give it a little kick. Very very good. And if it wasn't so time consuming to make these, I would defintely make these fairly often. As my sister said when I asked if we should keep the recipe, "Well, I'll definitely eat them again." To prepare pasta, lightly spoon flour into dry measuring cups; level with a knife. Combine flours and 1/2 tsp. salt in a food processor; process 30 seconds. Combine 5 tbsp water, 1 tbsp oil, and eggs, stirring well. (A) With processor running, slowly pour water mixture through food chute, processing just until dough forms a ball. (B) Turn dough out onto a lightly floured surface; knead 6 times. Shape dough into a disk. Dust dough lightly with flour; wrap in plastic wrap. Let stand 30 minutes. Divide dough into 14 equal portions. Working with 1 portion at a time (cover remaining dough to prevent drying), press dough flat. (C) Roll 2 dough portions into 18x3-inch rectangles (turning dough over occasionally and dusting surface lightly with flour). Lay pasta sheets flat; cover. Combine chickpeas and next 6 ingredients (through 1 clove garlic) in a food processor; process until smooth. Place 1 pasta sheet on a lightly floured work surface. (D) Spoon about 1 1/2 tsp. filling mixture 1 1/2 inches from left edge of sheet; spoon 1 1/2 tsp. filling mixture at 3-inch intervals along the length of sheet. 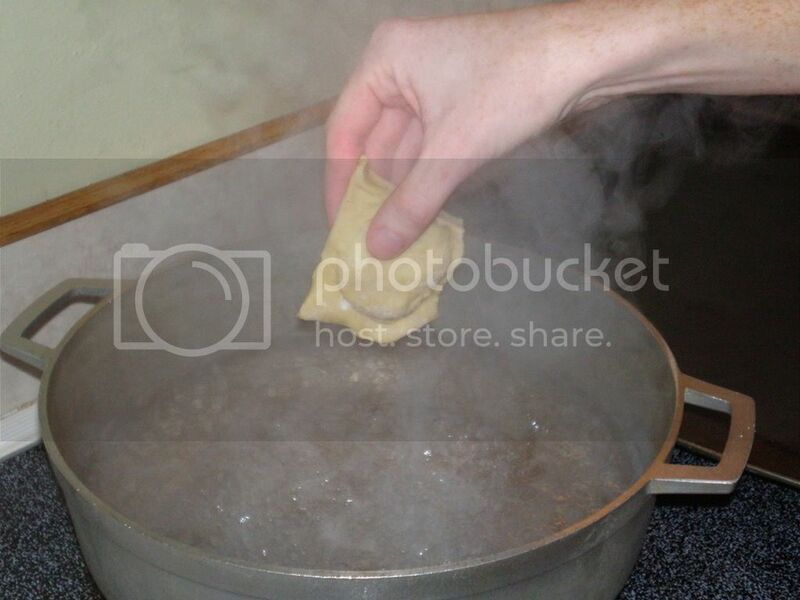 (E) Moisten edges and in between each filling portion with water; place remaining pasta sheet on top, pressing to seal. 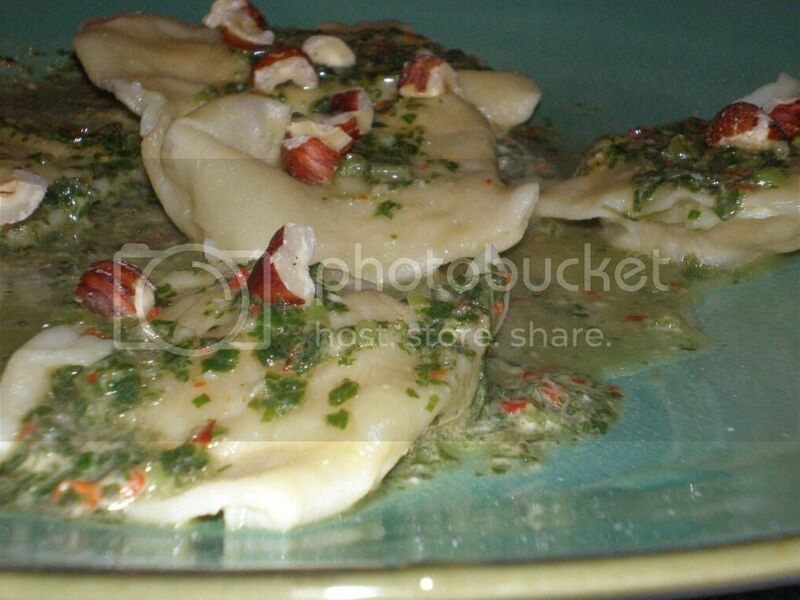 Cut pasta sheet into 6 (3x3-inch) ravioli, trimming edges with a sharp knife or pastry wheel. Brsh excess flour from ravioli; (F) press gently to flatten tops. 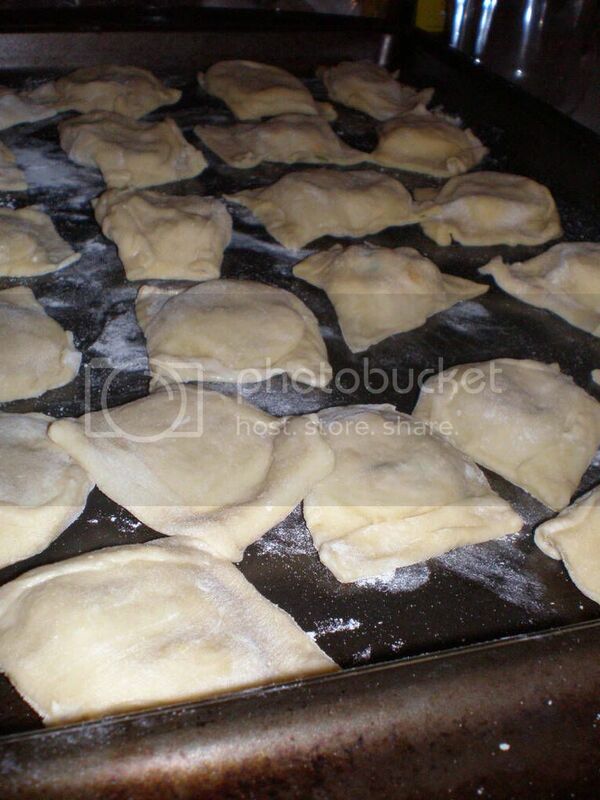 Place ravioli on a lightly floured baking sheet (cover with a damp towel to prevent drying). 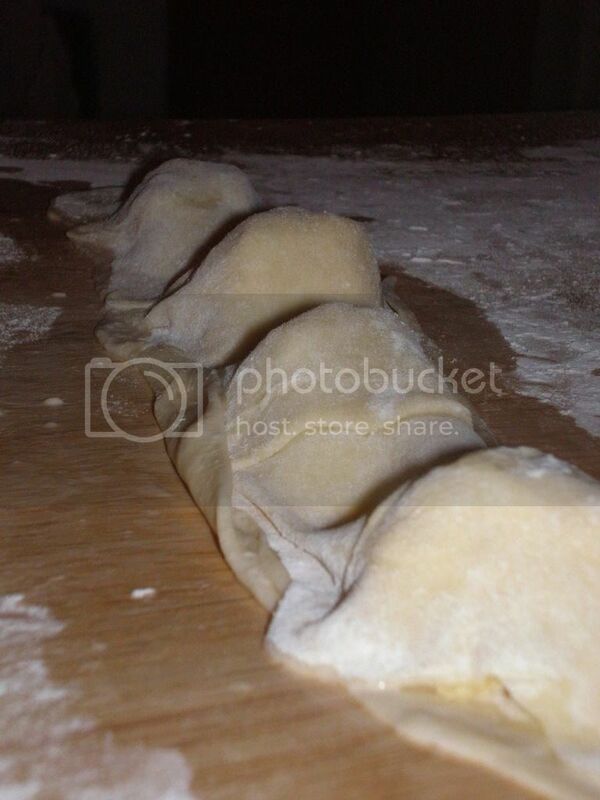 Repeat procedure with the remaining dough portions and filling mixture to form 42 ravioli. Bring 6 quarts of water and 1 tbsp. salt to a boil in a large Dutch oven. Add 6 ravioli to pan; cook 1 1/2 minutes or until no longer translucent. Remove ravioli from water with a slotted spoon. 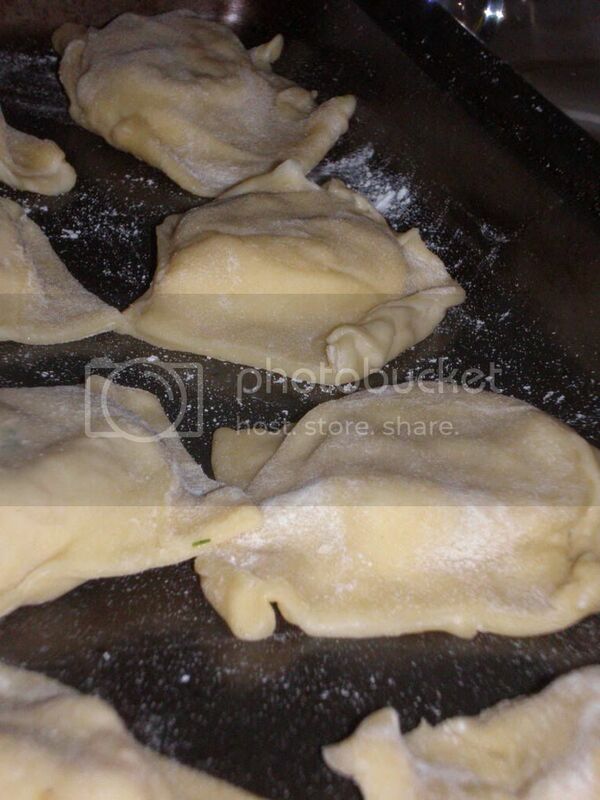 Place ravioli on a tray, making sure they do not overlap; cover and keep warm. Repeat procedure with remaining ravioli. To prepare pesto, combine basil and next 5 ingredients (through 1 garlic clove) in a food processor; process until smooth. With processor on, slowly pour 1 1/2 tbsp. oil through food chute; process until well blended. Serve with ravioli. Sprinkle with hazelnuts. Yield: 7 servings of 6 ravioli each. Tyler and I really want to try making our own pasta soon! I need to find a Saturday to set aside for this!